When I first heard Sia sing this song, I was astonished. I just fell in love with the song. And as eccentric and unconventional as the video is, I really like it. Sia is truly a musical genius, in my opinion. Every song she creates is magic and really complements not just her style, but the artist's style too. She's written a lot of great songs by some of the best singers too including Christina Aguilera. In my opinion, Chandelier embodies all of the things you love in life. It is as free-spirited as freedom gets. The song tells a story that embraces life, love and liberation. If you can't see the video, simply click here to listen. Make sure you are wearing headphones. It is officially the first day of Summer. I woke up in a relatively great mood. The weather is incredible, as it is not too hot or cold. Although the humidity prevents it from being pristine, I would say the environment is close to it for the first day of the hottest season. I am going to leave for work shortly, but want to make a smoothie before I go. I am thinking banana and dates with perhaps some chocolate almond milk? I like to add some coconut sugar for good measure. I don't know what it is with me and coconut sugar, as I seem to really be loving and appreciating it. And speaking of coconut sugar, I do have to go grocery shopping after work today. I really love the fruit and vegetable stands here in Idaho. Everything is modestly fresh and organic. The prices are exceptionally good. I have lived all over yet I find myself appreciating this. One thing about Idaho that I find fascinating is the fact that it is hotter in the evening than the late morning/early afternoon. I think it is the only state I have ever been in that is like this. Perhaps this is why so many grow crops (potatoes and onions more than anything else) here. For work today, I am wearing a simple mustard, gold colored v-neck shirt with a black belt and black pencil skirt. The shirt (which is visible) is from J.Crew. As you can kind of tell in my selfie today. The skirt is from BCBGMaxAzria (which is non-visible from the selfie) and the belt I bought from Forever 21. In terms of beauty products, I am very much obsessed with the Giorgio Armani Beauty Armani Prima Glow-On Moisturizing Face Balm, LORAC POREfection Foundation, By Terry Paris Ombre Blackstar Cream Eyeshadow Pen in Bronze Moon (No. 4), Benefit Cosmetics goof proof eyebrow pencil, and Kylie Cosmetics Matte Liquid Lipstick in Libra. I love more things, but I only have a few minutes. I want to also add that I am currently obsessed with the Goutal Paris Rose Pompon Parfum. I own an array of perfumes yet I find myself reaching for this one the most. The fragrance is one of the best things you will ever smell in your life. I'll create a beauty favorites and share what I love for the month. Anyways, I am off. Off to work that is. Have a wonderful day! Lemon Juice, Grade B Maple Syrup, and Cayenne Pepper mixed with water. Drink nothing, but the detox for at least 5 days. Nothing else. To avoid hunger, it is very crucial to make enough of the detox to drink every time you feel hungry. Not only is this guaranteed to detoxify your body, removing impurities, but it works to help you lose weight. But the question on everyone's minds is - does it work? The answer is yes. Absolutely. Results vary, but there are results for everyone who does this. And if you decide to extend this detox it is key to take breaks in between for avoid malnutrition. Very sad and devastated to hear about the death of Kate Spade. When I first heard about her death, I was very sad. As her death was ruled a "suicide" she is proof that mental illness does not discriminate and can happen to anyone. Building a $2.5 billion fashion empire from her Manhattan apartment, Kate is proof that everyone in life is going through some sort of struggle, no matter what their economic status is. And often times the pain is unseen. Sometimes those who suffer in silence look for a way out and find themselves stuck in the darkness with no way towards the light. As there are many suffering in silence, it is very crucial to treat everyone respectfully as you never know what kind of battle they are fighting. Kate Spade was a woman with a voice, a vision and a message in which she depicted in her fashion and accessories. She will be forever missed, as her fashion house will remain and Kate Spade enthusiasts will continue to embrace the true visionary Spade was. I took to my favorite escapism at the moment, Smule to join my friend Jarell Bradley (Reject_RELL) open duet of It's So Hard To Say Goodbye (To Yesterday). Originally by Boyz II Men, this song really tells a story. When I hear this song it brings back memories of my childhood. I always love singing with RELL, as he is not only an amazing singer, but such a kind soul also. To listen to our rendition of It's So Hard To Say Goodbye To Yesterday, simply watch the video above or click here now. Today I decided to surprise Sumit with these selfies. 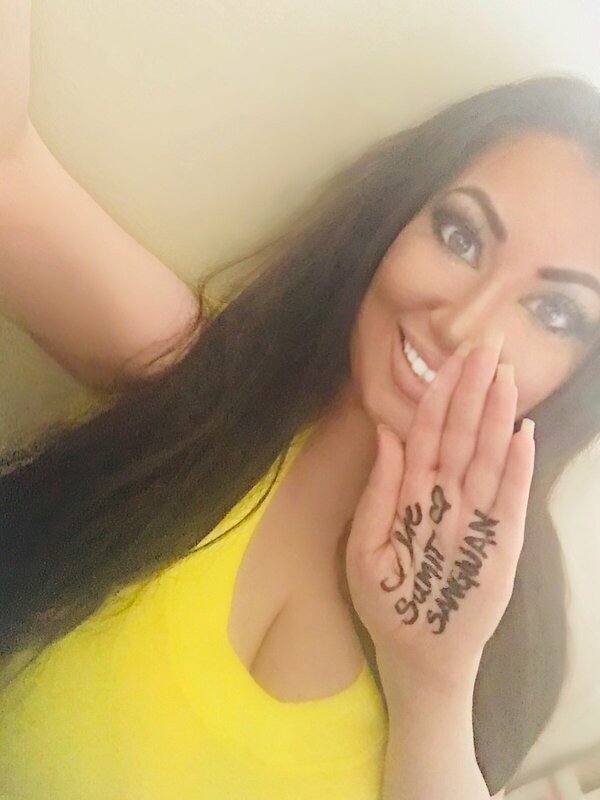 I took the initiative of professing my love to him by writing on my hand. And in case you are wondering, I did not use a sharpie to write this, I used a felt tip eyeliner pen. 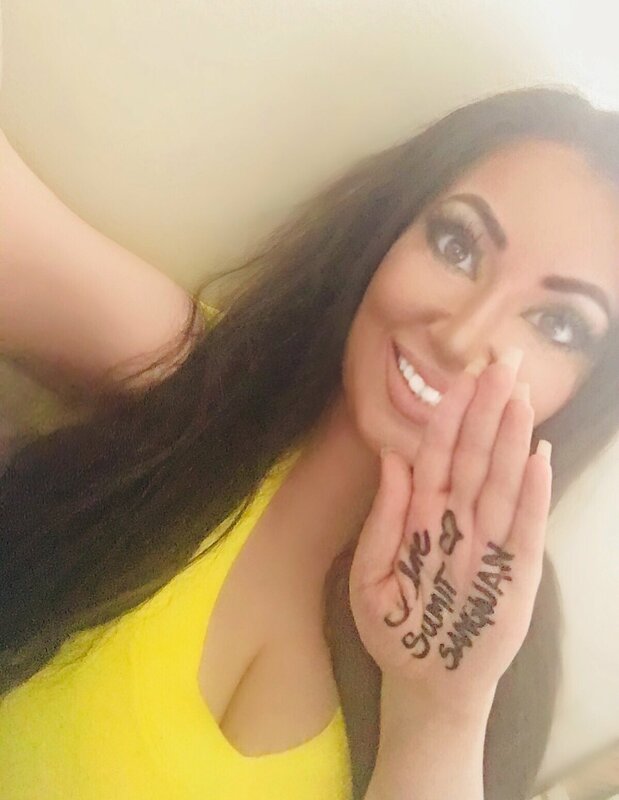 In fact, I used the Eyeko 'Eye Do' Liquid Eyeliner to write the message on my hand and I filled the heart in with the Too Faced Sketch Marker Liquid Art Eyeliner in Canary Yellow. Sumit is the new man in my life, as I met him in mid-to-late April. We just started seeing each other. I have been very happy in my life and I owe a lot of my happiness to him. He's going through a tough time in life, but in the end he is a real warrior so good, great and amazing things will be waiting for him. Every time I talk to Sumit, I feel a sense of true contentment and I am so extremely satisfied with my life, as a result. He is definitely someone who both inspires and motivates me. And for that, I am genuinely grateful. Today I decided to really look at my life and dissect everything. Instead of looking at my life one-dimensionally, I decided to really look at it fully. What do I love? What do I hate? What can I change? What can I rearrange? Is it ok? Does it slay? I've come to realization that it is pointless to overthink, as any type of rumination (and ruination) will not solve the problem, but rather amplify it. And sometimes this kind of mindset can create problems that simply do not exist. The world can be a dark place, but if we bring ourselves into the light, we can shine in spite of any darkness that attempts to delude us. Today, I realize this more than ever and I am happy about it. On another note, I have decided to reinvent this blog to feature an array of topics and not just commentary. So, I want let you know that most of the makeup I used in my selfies today are from Giorgio Armani Beauty, Urban Decay and LORAC. I also used Benefit Cosmetics. If you want to know specifics or have any beauty related questions, feel free to ask in the comments or reach out via contact form here. Rebel Yell is one of those dynamic 80s pop rock songs that sounds modern even when played today. Tonight, I decided to join my friend Lashonda's open duet for the song on Smule. We totally rocked it out and we rebel yelled. I always love joining Lashonda's songs. To listen to us sing Rebel Yell together, simply watch the video above. If you cannot see or hear the video above, simply click here right now. Remember to listen to this recording with headphones.